On the Internet, nothing happens in a vacuum. Your site, your traffic and your readers are being constantly impacted and affected by things that are going on elsewhere. If Google makes a change to their algorithm, for example, this can have a drastic impact on your traffic and the type of readers you get. Likewise, what your readers are looking for and talking about will, inevitably, be affected by what other sites are discussing and what they’re seeing elsewhere. The simple truth is that you don’t have a single reader who only views your site and nothing else on the Web. Everyone on the Web is reading other sites, emailing, IMing, using social networking and participating in the Web in countless other ways. Because of this, you can’t try to make your site stand alone or treat it as if it’s the only place your readers need to be. Your readers’ interests are both varied and deep and, short of having the entire Library of Congress on your site, there’s no way you can be all things to them. As such, the best thing you can do is not try and, instead, try to take advantage of this natural ebb and flow of the Web by using it as a means to both make your site more useful to your readers and, perhaps more importantly, gain even more traffic. 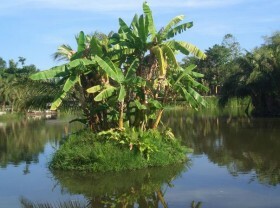 No site is an island unto itself and, even if it could be, it’s unlikely that you’d even want it that way. When developing a site, especially for those who are new at it, there’s a temptation to try to make their site a “destination” on the Web, a place people go and don’t leave. But while it’s great to have people who want to spend time on your site and click on many of your links, some webmasters and even some bloggers attempt to encourage this behavior by trying to cut off their site from the rest of the Web. These sites rarely, if ever, link out, discourage comments, especially those with links, and almost never reference the works of others. Sometimes these sites take it so far as to commit acts of borderline plagiarism, taking topics and ideas from elsewhere without as much as a link or a simple acknowledgement. The idea is that, if visitors don’t have anywhere to go, they are less likely to leave and more likely to find something else to do on the site they’re on. Unfortunately, this rarely works. Visitors always have access to their “Back” button and their address bar, not to mention closing the tab or even the browser itself. Visitors aren’t prisoners and just because there isn’t an easy place to go doesn’t mean they will stay longer. However, this behavior can negatively affect your site’s performance. Other sites don’t like linking to one-way dead ends and search engines frown upon this practice as well. Since your visitors have to come from somewhere, trying to make yourself an island may do less to keep your visitors around and more to cut your site off, virtually ensuring that others never hear about it or see it at all. One of the first things every blogger needs to know is how others, including themselves, surf the Web. You quickly realize that there’s no straight lines on the Web and no true dead ends. Most people start at one site, perhaps a social networking one or a place they already know, and follow links until they reach a point where there’s nothing more they want to look at on that thread. Then they either close the tab, go back or type in another site to start the chain over again. You won’t keep visitors on your site any longer by not linking out or mentioning other sites. However, you’ll definitely limit the other sites who link to you and that, in turn, will limit how much Google trusts your site. You don’t have to always link back to the sites that link to you, but if others sense that you aren’t linking out, especially if you aren’t giving credit where it’s due, they aren’t going to direct their visitors your way. For your site, it’s much better to be a well-traveled path than it is to be an unknown dead end. On that note, there are a few things you can do to encourage others to include you in their linking and, equally important, make your visitors want to stay when they arrive. Link Liberally: Try to include a few links in every post you write, including at least one to another article on your site. Make Sure Pingbacks and Trackbacks Are Enabled: When linking, make sure to send pingbacks or trackbacks. Even though they likely won’t appear on the site you’re linking to, they will alert the other blogger that you’ve talked about their site and encourage them to either participate in the conversation or return the favor. Provide High-Quality Content: Write high-quality content, include eye-catching images and bundle it in an attractive site. Give people a reason to stay on your site and they will. Offer “Related Articles” Links: In addition to giving readers good content, give them a way to discover other great content on your site. There are various related articles plugins for WordPress and services like LinkWithin to automate the process. Find Ways to Connect with Your Readers: Finally, no matter how interesting your site is, you have to assume that your readers are going to leave it eventually. As such, you need to give them a reason and a means to come back. Encourage them to subscribe via RSS, join your mailing list, follow you on Facebook/Twitter and so forth. Connect with them where they are normally and they will usually find their way back. In short, there’s a difference between trying to trap your visitors on your site and giving them a good reason to stay. If you make your visitors want to stay, you become less of a dead end and more of a roadside attraction. Not only do they enjoy spending time on your site, but others are more likely to direct their visitors there because it benefits their audience as well. If you want to “trap” your visitors, do it by making your site a place they want to go, not by trying to make it an island they can’t easily get off of. In the end, if people want to stay on your site, they’re going to stay. If they want to leave, they’re going to leave. No matter what you do, short of annoying popups or other even more hated tricks, your visitors are never more than a single mouse click from leaving your site at any time and fighting that is futile and is likely to discourage visitors from coming by in the first place. However, if you give readers a compelling reason to stay and don’t treat your site as an island, you may be surprised how many stick around for a very, very long time and, even better, come back after they leave. That, more than anything will make your site a destination and a place where people start and stop their journeys on the Web.